Big Big Bowl Cafe, my first impression when invited by Ivy to have dinner there was that this restaurant must serve their dishes in big bowls. Well, I wasn't very far off from the truth, as there are dishes served in rather large bowls, but Big Big Bowl Cafe is most famous for its Hakka dishes. It's signature dish would be the Hakka Lui Cha (Pounded Tea) dish which I have the pleasure of having that evening. Mon – Fri: 11 a.m. till 9 p.m. Sat – Sun: 11 a.m. till 10 p.m. Located just opposite Jusco in Kepong, the place wasn't really hard to find. The atmosphere was really homely, as the owner Angie came out to welcome us. Big Big Bowl Cafe markets itself as a cafe serving traditional Hakka dishes, one which I have not had the chance to taste until that evening. The first dish I had the opportunity to have was their signature dish, the Hakka Lui Cha. I was initially apprehensive over the green colour of the dish, as this was my first time trying. Upon mixing the ingredients with the Lui Cha (pounded tea soup), I would say it tasted really good, with the correct amount of crunchiness from the nuts. The Lui Cha was home-made,and really unique to say the least. The first dish was really a healthy dish, which actually makes it easier to proceed for the rest of the really delicious but slightly more savory dishes. Check out below on the other dishes we had that night. I just have to mention that I really liked this dish #3 Claypot Siam Style Pork Belly, it had just the right amount of spiciness and lots of dried chilli with the extra Basil leaves to bring out the taste. #4 Claypot Vinegar Trotters will have to be one of the oiliest dishes I have taken in a while. I guess that's what you get when ordering trotters. The vinegar added in was surprisingly good, just the right amount, not too much. The same Seven Veggie Pan Mee being evenly distributed out because the bowl was just too large for a single person! The dish #8 Big Big Bowl's Mixed Platter had a mixture of marmite chicken, fried pork, fried dumplings and toufu. One cannot go wrong with marmite chicken I tell you, something which I can keep munching on. When the dish #9 Udon Special with Sambal/Black Pepper was served, I was already so stuffed with all the previous delicious food that I couldn't really fully enjoy the Udon. Served with a thin layer of fried egg, this dish can be taken on its own on any evening. Our healthy tea to wash down all the delicious Hakka food. Needless to say, I was stuffed to the brim, and the reason I'm so stuffed was the fact that all the dishes were too tempting. 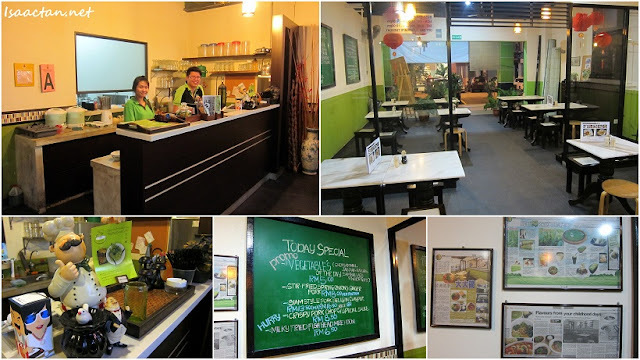 Do check out this good restaurant Big Big Bowl Cafe should you be in the mood for some traditional Hakka dishes. It's really that good I tell you, and I wouldn't mind dropping by again soon for some more of that Hakka Lui Cha and Pork Belly. My eating kakis that evening, awesome people. I'm half hakka but I can't eve stand the smell of lui cha, not to mention having it :P The claypot rice wine chicken looks good! fuh, life on the food line! whoa.. never eat any Hakka dishes before.. Sabahan Hakka mostly eat the local food also.. Gonna have a try.. ^_^.v..
that curry pan mee must be yummy! btw, hope u will receive yr gift this time. Eeeeyyyyyeeeewwww!!!! I always call liu cha - horse food. No, thank you. The rest looks pretty good...but not all served in big bowls leh? I see some in plates...plus they don't look big in your photos. Hehehehehe!!! Thanks for the good food update and review! Keep up the good work! Thunder rice tea aka lui cha are eaten by mainly the Hobor Hak another Hakka clan coz Bananaz have not eaten or heard about it too being half Hakka too. Thunder sounds like 'lui' but nothing to do with thunder haha. Bananaz loves it very much coz of the nuts and all vegies mixed together haha. Tried helping out once cutting the vegies tell you its tough cutting them to such small pieces. In this modern era not sure how they grind the tea probably by machine. Its not pounded tea but using a wooden rod to go round the big bowl grinding the tea thus the name 'lui' cha in Hakka. I was telling Henry that the Claypot Siam Style Pork Belly and the Trotters looks amazingly delicous. Must head to this part of kepong and try out their dishes. Awesome posting for recipes ! Lady Finger veg. My Favorite i love it . yummy food and that's delicious look. Lui Cha is awesome wei!! And tht 7 veggies pan mee is so me! Luv vegs! what is the green noodle looking dish in the small bowl?